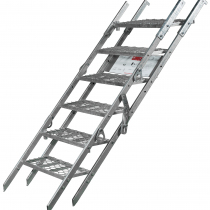 It has a base size of 3.0m by 1.6m, and with stair units in 1.0m, 1.5m and 2m lift heights, is fully adaptable to all height level requirements. 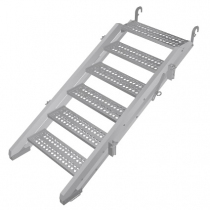 Can be used as a stand alone Stair tower to access a range of structures and buildings or used in conjunction with scaffold tube & fittings or one of the many system scaffolds. The maximum construction height for the Uniscaff temporary stair case with platform levels and stair flights every two metres is 30m. It must be anchored to a structure at each platform level on both sides of the inner and outer standards using scaffold tube and couplers. For height in excess of 30m please consult our sales team for technical guidance. 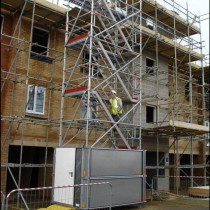 The uniscaff scaffold stair tower system has a safe working load of 1.5kN/m2. We now have an erection and user guide for the Uniscaff system in a DVD video format or click on the product download on this page.